Question: Do you recommend Corning Visionware? Ok, while I could leave it at that I will elaborate. First I have to address the fact that several people have confused me with other bloggers who DO recommend Corning Visionware, and I specifically have not ever recommended this product personally — because I have consistently found widely-varying results across the population of many similar – and even seemingly identical -Visionware pieces I have tested using a state-of-the-art XRF instrument! So unfortunately, I am simply not able to say anything along the lines of “all Visionware pieces I have tested are lead-free.”, or even, “avoid this particular model or date range” — which is, after all, the kind of clear determination that my followers are generally looking for! My lack of recommendation is largely based on the fact that I have not found any way to draw a distinct conclusion for parameters that would dictate even whether or which of the pieces might be likely to be lead-free. Here’s a link to share this post on Facebook! Are certain pieces from certain countries of origin lead free? Are certain pieces from certain years of manufacture lead-free? To see more amber glass items I have tested, click here. *Non-Detect = “negative”, within the testing limitations of an XRF instrument. Note: just because an element is listed (because it is an element present in a particular manufactured amber glass item) does not mean it either is – or might in the future be – leaching. My own work testing consumer items for toxicants (such as Lead, Mercury, Cadmium, and Arsenic) using an XRF instrument and posting my findings is not rooted-in nor confined to just concerns for leaching, nor is it equivalent to leach-testing. Testing with an XRF instrument gives a highly accurate breakdown of the actual total content of the elemental metals in a consumer good — without any evaluation of whether or not these elements might constitute any toxicity concerns directly to the end user. The “nastiest” metals – again, Lead, Mercury, Cadmium, and Arsenic, in consumer goods are sometimes bio-available, but in many cases they have been “determined” (troublingly, often by the industry producing the item*) to not be bio-available. *Or using regulatory standards & levels that were set – wholly or partly – by the regulated industry. While the potential toxicity risk of an individual/particular product, as used by a particular consumer, may be nearly impossible to quantify (given the sheer number of toxic products we have in our homes), the inclusion of these toxic metals in consumer products seems irresponsible by modern standards. Click the image to see the XRF readings for this piece too. To see more Visionware pieces I have tested, click here. In making my personal decision as to whether or not any consumer goods are safe (or an ideal choice) for my family, I look for things that are first free (ideally, of even “trace” levels) of lead, mercury, arsenic and cadmium – and then expand my concerns to antimony and other carcinogens if they are present. To see the XRF test results of this pan, click the image. If consumers want more information I always encourage people to ask companies of cookware products especially IF the company has done leach testing and if those test results are available for the public to review. When making this inquiry, it is also important to know what metals the product was leach tested for. I will be posting test results for many other pieces similar to this shortly and will also do a wrap-up post with all of the test results so you can compare different items and get a sense of my concern. Please note: These test results that I will be posting shortly include results from at least one newly made Corning Visions piece (2018) that was positive for trace levels of lead when tested with an XRF instrument. For my family I choose undecorated cast iron, clear glass and stainless steel for cooking. similar to items I use for my family, click here. Thank you for taking the time to read this post and also to share it with others! 12 Responses to #AskTamara: Do you recommend Corning Visionware? Hi Tamara, I appreciate all the work that you do. Is there a clear glass cookware that you recommend? I thought about buying Visions cookware because I don’t see a healthier alternative. In terms of stove top cooking, is there healthy clear glass cookware. Thank you in advance for your reply. I really love Pyrex modern clear glass options, although I don’t know if they have any stove top use products available at this time. I will look around and let you know. I recently found out that I am allergic to nickel and I’m very concerned about other metals being in my cookware. Is there anything that you can recommend besides stainless steel or cast iron cookware? Clear glass products made by Luminarc are generally a good choice across the board (from a Lead perspective) as well! I have not tested the base material for these pots though, they are likely either lead-free or low-lead. There is not really a way for me to make an educated guess on those without testing them. Oftentimes pots like this that one might EXPECT to be low-lead or negative end up having a painted logo or other decorated mark that is not visible in the online product photos. Those logo markings are often high-lead, so that would be something to look for in making this decision. The lid is indeed made with borosilicate glass, but the body is made with something called Vitroceramic, which I have not found a lot info about online. Have you ever had experience with Vitroceramic? How is it different from the material used for Visions? Jon, “Vitroceramic” is a marketing buzzword for “glass-ceramic”. They are actually made of Pyroceram just like Visions and Luminarc has amber transparent versions of those same pots (whether a piece is transparent or opaque is just a matter of what temperature it was cerammed at in the furnace during crystallization). In fact, at this point in time, I believe all Pyroceram products are made at the same factory in France. Visions *IS* a healthy stovetop cookware choice. It has not been made with lead in the 4 decades it’s been in production. Although, there may be some glass covers that have been reported to have low levels of lead on this site, I have never seen a single reputable source showing lead in the cookware itself (and as mentioned it is not made of ordinary glass like the covers – which are produced in an entirely different factory). 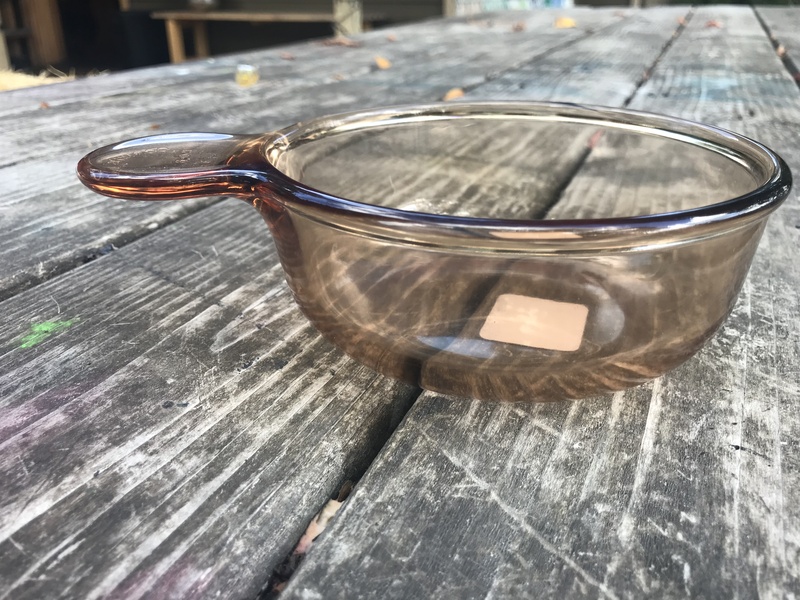 If for some reason a person has concerns over the glass covers, they can still safely use the Visions cookware itself and source clear glass lids. Thank you so much for your blog. I was wondering if you have an opinion on Extrema cookware? Is Extrema cookware any better and visionware? Thank you very much! Hi Tamara, I found your post on Extrema cookware. Thank you very much – you answered the question exhaustively. I will stay away from Extrema cookware. Just seeing this follow up comment.